« FAQ: what is a political party? Should freedom of speech ever be curtailed? A couple of issues this week have combined quite powerfully to raise the issue of freedom of speech. Jan Moir, a columnist for the Daily Mail, wrote an article about Stephen Gately’s death, with alleged homophobic inferences. This resulted in 21,000 complaints to the Press Complaint’s Commission after an internet campaign which led to calls for Moir to be prosecuted or sacked from her job. This Thursday, Nick Griffin, leader of the racist BNP, will take his place on the BBC’s Question Time panel. Labour’s Peter Hain has suggested that the invite should be reversed because the BNP were acting illegally by not opening up its own membership to ethnic minorities. Freedom of speech is an important pillar of liberal thought. But it is not a simple concept. 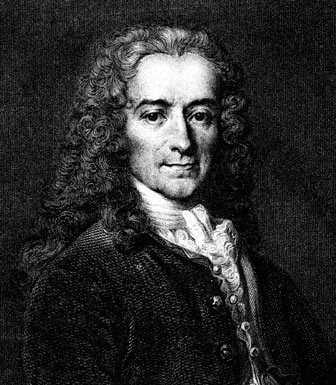 Should we stick with Voltaire’s (1694-1778) dictum that, “I detest what you say but will defend to the death your right to say it”? Or should we invoke the liberal concept of toleration, and claim that those who espouse intolerant views should not be allowed to do so. It would be interesting to get some comments from you guys on this. Should we be like Voltaire, and accept the right of Moir and Griffin to say things we consider offensive, or should we limit the platform on which they publicly air their views? This entry was posted on October 20, 2009 at 9:32 am	and is filed under Liberalism. Tagged: Freedom of speech. You can follow any responses to this entry through the RSS 2.0 feed. You can leave a response, or trackback from your own site. I’m with Voltaire on this one, if you ban people from saying extremist or offensive things publicly it won’t stop them from being thought or said in every day society. At least if people announce their views people can argue rationally against the ideas. Also where do you draw the line on limiting speech? You can’t control the internet unless you make it state-run, like in China. This is a democracy, and freedom of speech is a right. Emma – interesting and very well-argued. Let me push you further, though. Doesn’t your solution to this problem presume that a rational debate can be had with racists and homophobes, or that others will accept your rational arguments regarding racism and homophobia? What happens if a rational debate does not or cannot take place? I think rational debate can be had with people with prejudices, simply because they have a taboo opinion of people doesn’t mean they’re all unwilling to see things from another side. A lot of prejudices are down to ignorance, if someone was brought up in a racist environment they may well be racist themselves and have never tried to see it any other way than that. If someone were to tell the other side of the story people may change their opinions. I don’t think this would happen in every case but even if there are a few less prejudice people about it would be better than a few more. If rational debate can’t or doesn’t take place then the problem escalates and it is the British public’s duty to speak out, using each one of their own freedom of speech, against the prejudice; which is exactly what will happen on Question Time tomorrow. The majority speaking out against the minority of the BNP. A very good argument, Emma. This fits in very well with some of the things we’ve been exploring at A2. Let me press a little further, though. You make two assumptions here about human behaviour. Firstly, that most people are rational. Secondly, that people’s views are shaped by their environment. This is something a liberal (and indeed a socialist) would certainly agree with. An alternative view would be that human frailties, such as ignorance, fear and racism are inherent, a part of human nature, rather than human nurture. Look at how quickly the rational can turn to irrationality, for example, in Nazi Germany and Rwanda. Convinced? Nature plays no part in determining the opinions of a human being, it is down to society to ‘teach’ right and wrong. A capitalist society breeds humans who are driven by competition and self-interest leading to inequality and a lack of co-operation within a community. Society is at fault if people speak bad things, it is not the person that is bad; it is more that society has conditioned them to be bad. To change peoples opoinions rational debate needs to take place, because only with rational debate can the truth, ultimately, be found (disagree with that you disagree with JSM). So without a doubt giving Griffin a platform to air his views was the right thing to do – he has now been exposed as a racist to almost the whole population. His views, through this exposure, should be eliminated, but maybe some of his views (the ones he broadcasts in public at least) are respectable eg stemming the flow of immigration and if they are the ‘right’ argument then they may flourish. Personally, i think that Griffin should have been on a one-one interview with someone like Marr as the baying mob with all their booing and hollering meant he was never even able to finish a sentence. – Maybe humans are not so rational and logical after all . . .
By restricting what people can say you are restricting innovation, people can’t learn if they are not able to debate their views, the debating of views allows, the views on both sides to develop and even if they do not agree in the end at least the individuals are able to learnt about the other side of their argument this could lead to a change of point of view or the of course strengthening of it but is that really a bad thing? Yes of course you may get what is seen as an irrational argument, but who are we to say what is rational and not rational? I don’t believe one person or indeed a group of people have the right to say you has the right to say what they think and who doesn’t, let Griffin have his say and let people make their OWN decision about him and his views. As Emma said their are lots of factors which effect what peoples opinions, sometimes it is their environment and sometimes it is just how they personally see the world, is it nature vs. nature or is it both together which give us our views, personally I think you cant have one without the other.